Since 1984 our Thai Yoga Therapy Seminary and educational institution offers a solid program in healing and therapy ministry and service. Our core modality is SomaVeda Integrated Traditional Therapies®. 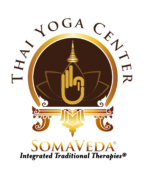 SomaVeda® modalities include Thai Yoga Therapy, Ayurveda and Indigenous Native Medicine. We offer religious therapeutic and continuing education certifications and authorization. Ministers, practitioners and sacred medicine counselors providers will find no better healing ministry tools. We are a AAPNA Registered School of Ayurveda.